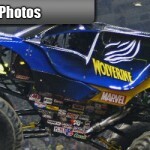 – Competed in 57 shows with 24 racing wins and 12 freestyle wins. 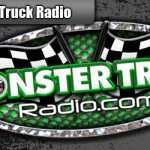 – Duhon’s 36 racing & freestyle wins ranked him 11th best in all of monster trucks in 2009. – Duhon’s 24 racing victories was the 5th best total of all drivers in 2009. 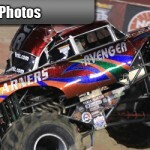 (Chris Arel Motorsports PR – By Doug De Nance) It was the best of times and the worst of times. There were many moments of gladness and some moments of sadness. The yin and the yang of motorsports entertainment were both in play during the far west stop on the 2010 Monster Spectacular tour. Despite the incredible excitement of Bill Payne and Rockstar living up to his reputation as the Washington Wildman and the exuberance of the California Kid in his ’34 Ford Sedan hot rod monster truck, there was an undercurrent of sadness in the pits. It emanated from the Sudden Impact team. While it was thrilling to see Chris Ryan having the opportunity to drive Ground Pounder to allow Bobo Winslow some time off the road, his team mate was the source of both the pall and the festivities. Earlier in the week, the Cajun Kid had quietly announced his retirement. Sean Duhon, the fantastic driver of Cult was hanging up his helmet. The Ragin’ Cajun would be ragin’ no more after these final two shows. After 7 years of 50 weeks a year on the road, Duhon was taking an extended leave of an undetermined length – perhaps permanently. While the all the friends in the pits were choked up, it certainly didn’t show in the shows, as every driver seemed to be raising their game to make the Cajun Kid’s swan song sweet for Duhon and extra sweet for the fans. 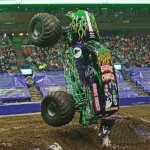 Abbotsford was first on the tour stop and another first for Bill Payne, rocking Rockstar to a huge Reverser wheelie win in the Monster Spectacular Wheelie Contest. The two pass format for the weekend worked well for Payne as he could rev the decibels up to rock concert volume in what is perhaps the loudest truck on the circuit. 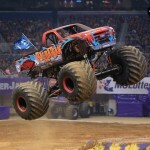 The sight of Rockstar flying backwards over the cars sent the fans into a fanatical frenzy that was fueled to fever pitch when each of the drivers took collector edition Monster Spectacular cowboy hats into the crowd after the cheer off. Payne looked like he was on a Rockstar roll to spoil the party for Duhon with the fastest time in time trials. With a 2:00 flat time over a five car stack, Rockstar had the pick of the brackets. Strangely, Payne chose to race against Ground Pounder who had the third best time – leaving an easy bracket win for Cult against California Kid. Payne had to work hard against the “round mound of renown” as the 260 pound Chris Ryan, better known as “Panda”, is a great young driver. 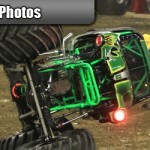 Ryan has raced everything from BMX to quads to RC cars and knows his way around a monster truck drag race. But Payne was very fast on the green light and had the advantage of a front engine mount truck to get a bit better trajectory over the cars. One had to speculate that Payne’s point was to set up a racing final that the fans would love. How could they not love seeing Rockstar versus Cult as the racing final for the first place tour stop points? While Payne is fast on the draw, he doesn’t have the experience of Duhon. 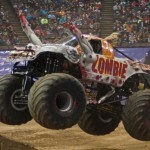 The Ragin’ Cajun parlayed that savvy into a clear cut Cult victory in Monster Spectacular Monster Truck Racing. 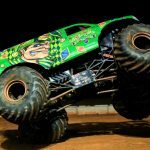 When the van stack was set and the crowd whipped into a whirlwind of cheers for Monster Truck Freestyle, Payne again surprised everyone with his next move. He jumped ahead of Cult to run third in freestyle. While one could hypothesize that Payne might have been inspired by the incredible runs of California Kid and Ground Pounder, it was hard to believe that Rockstar would give up his last position and the best chance at the points on the line. Payne took Rockstar to new heights – literally – catching massive air off of the cars and even bigger air off the van. He suffered the kiss of the remote ignition interrupter radio off of a van stack slap wheelie that saw him heading to the arena wall at full speed. But then it became clear as to the motivation of Payne’s madness. At the end of his run, Payne jammed the brakes on, dropping the nose of Rockstar almost under the bumper of Cult. 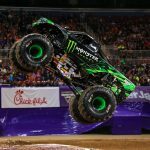 He was “bowing” to Duhon as a show of respect after setting the bar at the top of the game for the Cajun Kid to do what he does best – drive monster trucks. Cult roared onto the track and proceeded to shred the last semblance of cars and vans as Duhon literally tore the track to pieces. Hitting the cars in a cross thread, he took the 10,000 pound truck up into a bicycle on the passenger side two wheels and then drove out of what would be roll over for a lesser driver. That was the moment that epitomized what a fantastic driver Duhon is. 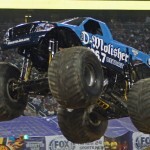 Anyone can roll a truck – it takes a great driver to run it to the ragged edge and then pull it back rubber side down. The crowd knew it too and screamed their approval when Duhon wrapped up his run. The drivers had to tire down and load up immediately after the show as they had a long ferry ride to the island for the Victoria Sunday matinee show. Bill Payne arrived in the beautiful city and almost immediately managed to find the most unique pub in Canada – Big Bad John’s, complete with various forms of autographed female undergarments donated by patrons over the years. Payne truly appears to live the Rockstar lifestyle (although he rarely drinks alcohol and was serenely sipping on orange juice during his visit to the legendary establishment). Rockstar again took the Wheelie Contest win with a Reverser Wheelie. But this time the Washington Wildman got a little too wild. Up onto two wheels and up onto his roof went Payne and Rockstar had rolled over for the 59th time. 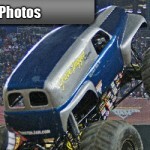 The crowd ate it up and Payne exited the truck by tossing the steering wheel out onto the track. He explained what many had wondered about over the weekend, that his black eye was caused by him smacking the bridge of his nose through the gap in his helmet onto his steering wheel during his 58th roll over the week before – and he didn’t want to have two black eyes. Racing took a much different twist in Victoria, as the final was at least 50 per cent unexpected. Due to a broken pin, Garrett Ladelle was unable to run his time trial, so the California Kid dropped to the bottom of the brackets. 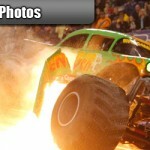 But the hot rod monster pounded Ground Pounder in the brackets and moved into the final. As happened in the previous show’s racing final, Cult played a power chord on Rockstar and a potential Cinderella story was now waiting to be written. During the VIP Half Time Pit Party, the California Kid was surrounded by beach babes. Ladelle glowed with the female fans attention and at the thought of winning racing. But while Duhon was choked up at driving in his final show, he certainly wasn’t choked on the starting line, handily beating the rookie for another racing win for Cult. What looked to be a perfect afternoon almost ended up in tragedy as Freestyle Motocross star Bruce Cook crashed on a his third backflip of the day. What was even more terrifying was that he was leading a two man FMX train with his mentor Kris Garwasiuk riding behind him. Thankfully, the original FMX champion is an incredibly skilled rider and Garwasiuk managed to avoid Cook on his landing. And even more thankfully, Cook suffered only bumps and bruises and was none the worse for wear. Not surprisingly Duhon was the final truck out for freestyle, thanks again to Bill Payne’s show of respect and giving up his final freestyle position. While Duhon’s run to the red light was nothing short of stellar, it was what went on after the red light that was truly delightful. Duhon knew that the competition was over, but he gave the fans their own exclusive freestyle show, giving the cheering fans twice as much freestyling out of Cult as was required. 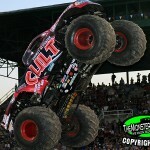 As Duhon emerged through Cult’s sky roof, the fans leapt to their feet, knowing they would tell their grandchildren that there were there that day – the day that Sean Duhon drove Cult for the final time. 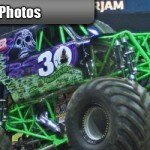 While it may be over for Duhon, the Monster Spectacular tour is not over yet. There is one more stop in the nation’s capital. 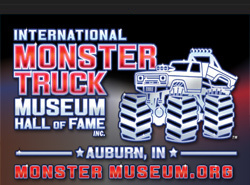 What could be a more fitting place to crown the 2010 Monster Spectacular champion?